We can see that this program consumes 379.39 MiB of virtual memory and resident size is 5.11 mb. Wait what? Why ~380 MiB? Resident Set Size(RSS) is number of memory pages the process has in real memory multiplied by pagesize. This excludes swapped out memory pages. Before deep diving into this problem, let’s go thru some basics of computer architecture and memory management in computers. Random-access memory (RAM /ræm/) is a form of computer data storage that stores data and machine code currently being used. I view physical memory as this array of slots/units, where slot can hold 8 bits of information 1. Each memory slot has an address and in your programs you tell CPU “yo CPU, could you grab that byte of information out of memory at address 0“, or “yo CPU, could you put this byte of information at address 1“. As computers typically are running multiple tasks, reading and writing directly from/to physical memory is a bad idea. Imagine how easy is to write a program, which reads all the stuff (including your passwords) out of memory or a program, which would write at different program’s memory addresses. That would be wild wild west. So, instead of doing things with Physical Memory we have a concept of Virtual Memory. When your program runs, it only sees it’s memory and it thinks that it’s the only one in here 2. Also, not all of your program’s stored memory bytes could be in RAM. If you don’t access specific memory block often enough, Operating System can put some block of memory into slower storage (like disk) saving precious RAM. And OS won’t even admit to your application that OS did it. But we all know that OS did it. 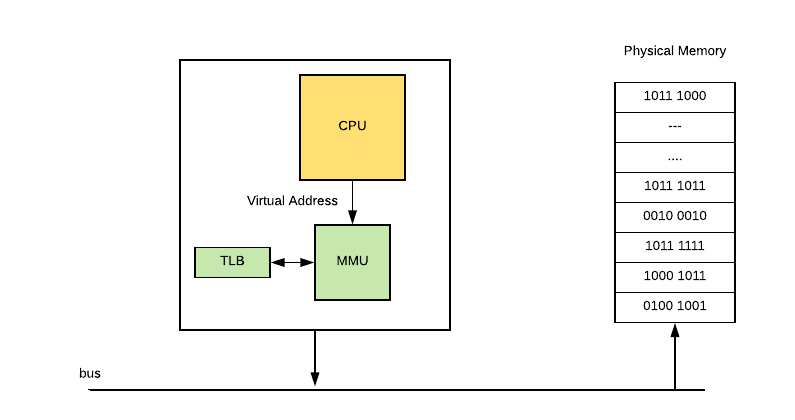 Virtual memory can be implemented using Segmentation or Page tables based on your CPU architecture and OS. I’m not going to go into detail about Segmentation as Page tables are way more common, but you can read more about Segmentation in 3. 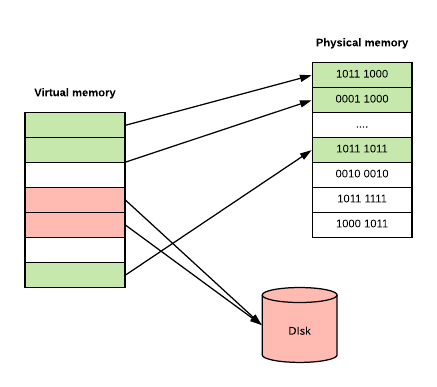 In Paged Virtual Memory, we divide virtual memory into blocks, called Pages. Pages can vary in size based on hardware, but usually pages are 4-64 KB, often with the capability to use huge pages from 2 MB to 1 GB. The division into blocks is useful as it would require a lot more memory to manage each memory slot individually and would slow down performance of your computer. CPU issues a command to access the virtual address, MMU check’s it in it’s Page Table and prohibits access, because no Physical RAM has been allocated to that virtual page. Then MMU sends a Page Fault to the CPU. The Operating System then handles the Page fault, by finding a spare memory block of RAM (called frame) and setting up new PTE to map it. If no RAM is free, it may choose an existing page, using some replacement algorithm, and save it to disk (this process is called paging). With some Memory Management Units, there can also be a shortage of Page Table Entrys, in which case the OS will have to free one for the new mapping. So this is a high level overview of what memory is and how it’s implemented using hardware and OS talking to each other. Now let’s take a look at what happens in OS, when you try to run your program and how programs can allocate memory. In order to run programs Operating System has a module, which loads programs and needed libraries, called program loader. In Linux you can call program loader from your program using execve() system call. Once loading is complete, the operating system starts the program by passing control to the loaded program code (executing a jump instruction to program’s entrypoint (_start)). So what is a program anyway? Usually you write programs in high-level languages like Go, which are compiled into either an executable machine code file or a non-executable machine-code object file (a library). These Object files, executable or not, are typically in a container format, such as Executable and Linkable Format (ELF) (typically in Linux), Portable Executable (typically in Windows). Sometimes you don’t have a luxury of writing everything in beloved Go. In that case, one option is to hand craft your own ELF binary and put machine code into correct ELF structure. Another option is to develop a program in assembly language, which remains human-readable while being more closely associated with machine code instructions. Object files are binary representations of program intended to execute directly on to processor. Those object files contain not only machine code, but also carry metadata about application, like OS architecture, debug information. Also object files carry application data, like global variables or constants. Typically object files are structured into sections such as the .text (executable code), .data (global variables), and .rodata (global constants) 7. You can also inspect ELF files using Linux tools like: size --format=sysv main or readelf -l main (here main is the output binary). The text segment contains a program’s instructions and literals and static constants. The data segment is working storage for the program. It can be preallocated and preloaded by exec and the process can extend or shrink it. The stack segment contains a program stack. It grows as the stack grows, but doesn’t shrink when the stack shrinks. The heap area commonly begins at the end of the .bss and .data segments and grows to larger addresses from there. Let’s take look at how processes can allocate memory. Static allocation is what happens when you declare a global variable. Each global variable defines one block of space, of a fixed size. The space is allocated once, when your program is started (part of the exec operation), and is never freed. Dynamic Allocation – is a technique in which programs determine as they are running where to store some information. You need dynamic allocation when the amount of memory you need, or how long you continue to need it, depends on factors that are not known before the program runs. mmap/munmap – allocates/deallocates fixed block memory page. 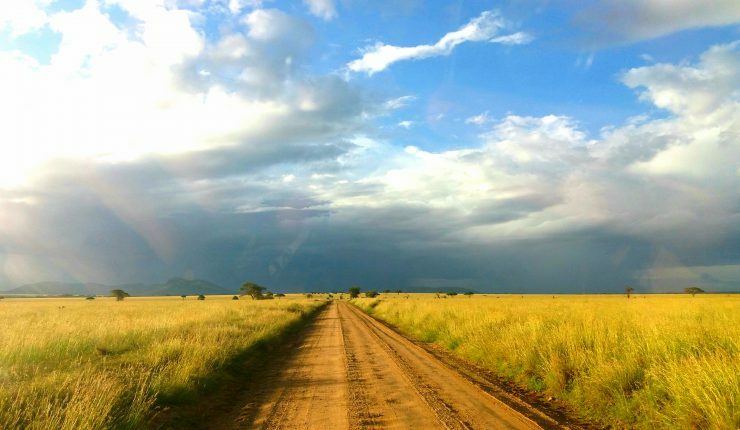 set_thread_area/get_thread_area – works with thread local storage. I think Go runtime only uses mmap, madvise, munmap and sbrk and it calls it directly to underlying OS via assembly or cgo, i.e. it’s not calling out to libc 10. These memory allocation are low level and typically programers don’t use them. More common is to use libc’s malloc family functions, where you ask for n bytes of memory and libc just returns it to you, and you need to call free to return it back. As Go doesn’t use malloc to get memory, but asks OS directly (via mmap), it has to implement memory allocation and deallocation on it’s own (like malloc does). Go’s memory allocator is originally based off TCMalloc: Thread-Caching Malloc. TCMalloc is faster than the glibc 2.3 malloc (available as a separate library called ptmalloc2). ptmalloc2 takes approximately 300 nanoseconds to execute a malloc. The TCMalloc implementation takes approximately 50 nanoseconds for the same operation pair. For small objects, there is virtually zero contention. For large objects, TCMalloc tries to use fine grained and efficient spinlocks. The secret behind TCMalloc performance is that it uses thread-local cache to store some preallocated memory “objects”, so that small allocations are satisfied from the thread-local cache 11. 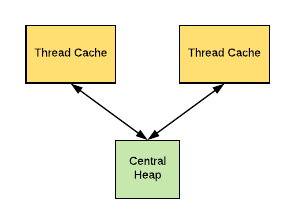 Once thread-local cache is out of space, memory objects are moved from central data structures into thread-local cache. TCMalloc treats small object (size <= 32K) allocation differently from large. Large objects are allocated directly from the central heap using a page-level allocator. While, small objects are maped to one of approximately 170 allocatable size-classes. We map its size to the corresponding size-class. Look in the corresponding free list in the thread cache for the current thread. If the free list is not empty, we remove the first object from the list and return it. We fetch a bunch of objects from a central free list for this size-class (the central free list is shared by all threads). Place them in the thread-local free list. Return one of the newly fetched objects to the applications. We allocate a run of pages from the central page allocator. Split the run into a set of objects of this size-class. Place the new objects on the central free list. As before, move some of these objects to the thread-local free list. For i < 256, the kth entry is a free list of runs that consist of k pages. The 256th entry is a free list of runs that have length >= 256 pages. We look in the k-th free list. If that free list is empty, we look in the next free list, and so forth. Eventually, we look in the last free list if necessary. If that fails, we fetch memory from the system. If an allocation for k pages is satisfied by a run of pages of length > k, the remainder of the run is re-inserted back into the appropriate free list in the page heap. The memory is managed in term of runs of contiguous pages, which are called Spans (this is important as Go also manages memory in terms of Spans). If free, the span is one of the entries in a page heap linked-list. If allocated, it is either a large object that has been handed off to the application, or a run of pages that have been split up into a sequence of small objects. In this example, span 1 occupies 2 pages, span 2 occupies 4 pages, span 3 occupies 1 page. A central array indexed by page number can be used to find the span to which a page belongs. idle – span, that has no objects and can be released back to the OS, or reused for heap allocation, or reused for stack memory. in use – span, that has atleast one heap object and may have space for more. stack – span, which is used for goroutine stack. This span can live either in stack or in heap, but not in both. 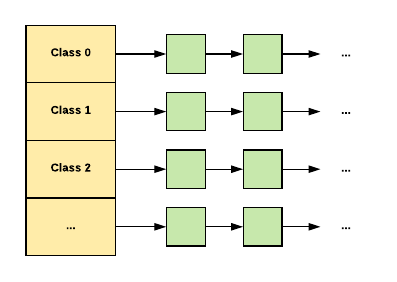 When allocation happens we map objects into 3 size classes: Tiny class for objects <16 bytes, Small class for objects up to 32 kB and Large class for other objects. Small allocation sizes are rounded to one of about 70 size classes, each of which has its own free set of objects of exactly that size. I found some interesting comments in runtime/malloc.go about Tiny allocator, and why it was introduced: > The main targets of tiny allocator are small strings and standalone escaping variables. On a json benchmark the allocator reduces number of allocations by ~12% and reduces heap size by ~20%. 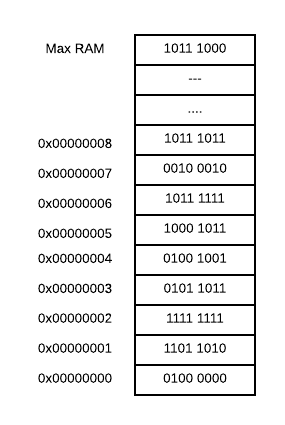 Tiny allocator combines several tiny allocation requests into a single memory block of 16 bytes. 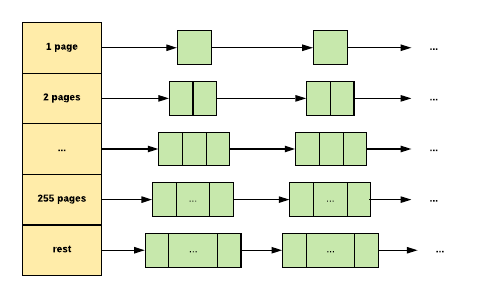 The resulting memory block is freed when all subobjects are unreachable. The subobjects can’t have pointers. Look in to corresponding tiny slot object in this P’s mcache. Round the size of existing subobject (if exists) into 8, 4 or 2 bytes based on the new object’s size. If the object fits together with existing subobjects, place it there. Look in the corresponding mspan in this P’s mcache. Obtain a new mspan from mcache. Scan the mspan‘s free bitmap to find a free slot. Obtain a new mspan from the mcentral‘s list of mspans of the required size class that have free space. Obtaining a whole span amortizes the cost of locking the mcentral. Obtain a run of pages from the mheap to use for the mspan. Allocate a new group of pages (at least 1MB) from the OS. Allocating a large run of pages amortizes the cost of talking to the OS. Round the size up to one of the small size classes. Allocating and freeing a large object uses the mheap directly, bypassing the mcache and mcentral. mheap is managed like in TCMalloc, where we have an array of free lists. Large objects are rounded up to page size (8K) and we look for kth entry in a free list, which consists of k pages, if it’s empty we go down. Rinse and repeat, until the 128 array entry. If we don’t find empty page in 127, we look for a span in leftover large pages (mspan.freelarge field) and if that fails we take from OS. So that’s all about Go Memory allocation, after digging thru this code runtime.MemStats makes way more sense to me. You can see all the reporting for size classes, you can view how many bytes object’s that implement memory management (like MCache, MSpan) take, etc. You can read more about memstats in exploring Prometheus Go metrics. Which gives us ~380 MiB of virtual memory size. – MemStats.Sys is the total bytes of memory obtained from the OS. Sys measures the virtual address space reserved by the Go runtime for the heap, stacks, and other internal data structures. – MemStats.HeapAlloc is bytes of allocated for heap objects. Doesn’t help as segment sizes are normal, only VmSize is huge. Summing all those addresses will probably leave me with the same ~380Mib. I am too lazy to sum it up. But it’s cool, scroll to the right you will see libc and other shared libraries mapped to your process. Hmm, that’s interesting, it’s only ~4Mib. 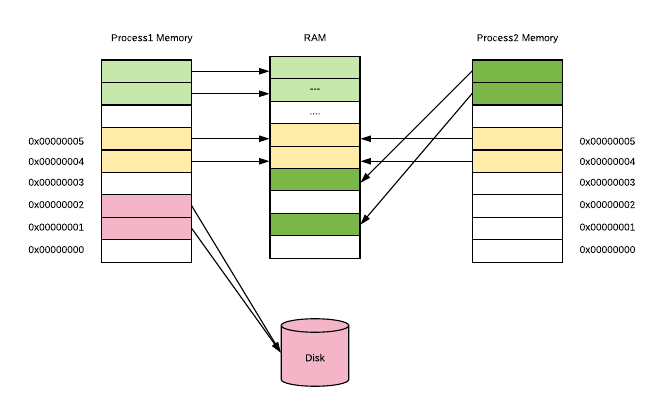 Really good refreshing read on overall the subject – memory management!